Check out Sage and Jen rockin' the course at Agility League at Zoom Room Longmont! You can view more info on Agility classes and League at Zoom Room Longmont's website. Thanks for dropping by! Maverick Shows 'em how it's Done! Maverick, what do you do in case of a fire?? ﻿Maverick perfected his Stop Drop and Roll and won 2nd place at a tricks contest at Zoom Room Longmont! Introducing - Maverick! Maverick is a 4 year old male blue merle Shetland Sheepdog (Sheltie). Recently, Maverick became a therapy dog so he can go to hospitals, retirement centers, and other places to visit people in need of a doggie pick-me-up. Currently he goes to the Longmont United Hospital to visit patients in the orthopedic area. We've just started, so stay tuned for more updates to come. 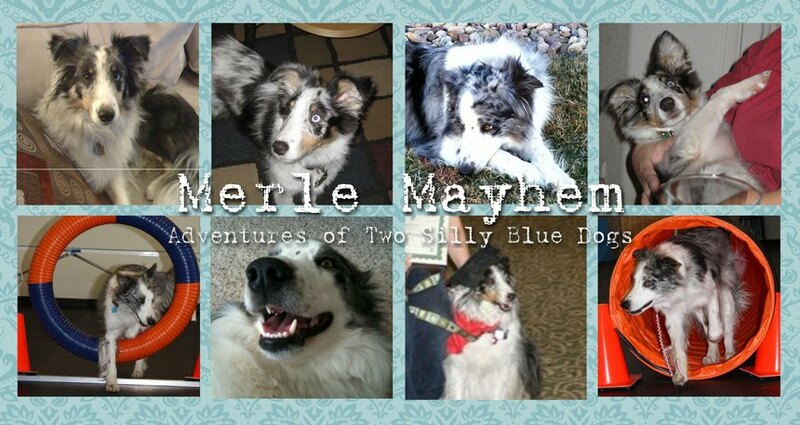 ﻿And to the adventures of these two silly blue merle pups! 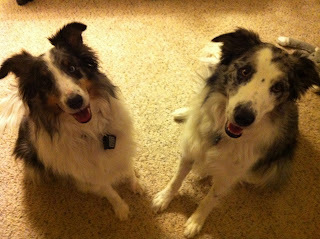 Maverick, a sheltie is on the left and Sage, an Aussie is on the right. Stay tuned to see what kind of trouble these two are getting into!